Ideal for residential and commerical applications, In-Line Threaded Filters protect regulator and meter sets from debris found in distribution piping systems. 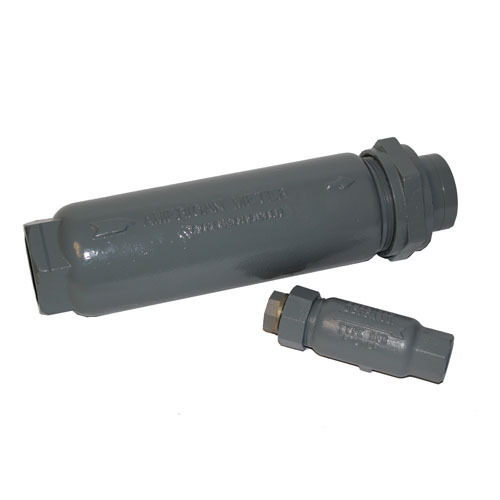 Cast iron design of the filter allows use in applications up to 160 psig and is equipped with a filter element which will remove particles as small as 5 microns. Available in ¾", 1", 1½" and 2" NPT(F) and BSP-TR sizes. Filter, ¾" NPT, 5M, INS. Filter, ¾" BSP, 5M, INS. Element, 5M, 1½" & 2" Filter..
Tail Union, ¾" NPT, NON-INS.